Isn't it time that the Webby Awards created a Best Use of Maps or a Location Aware category? Four of this year's Webby nominees are mapped based websites and of course many of the other websites, particularly in the travel and real estate categories, feature maps somewhere in their service. Sandrific.com is a nominee in the Personal Web Site category and is a great example of how Google Maps can be used to help share a personal passion with the world. 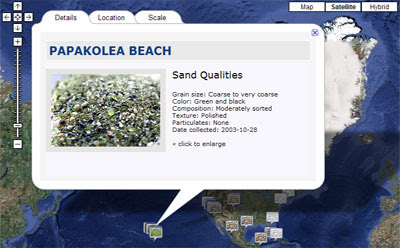 The website features mapped photos of sand collected by Betsy Kimak. With the help of family and friends, who have brought sand back from their vacations, Betsy has amassed a collection of sand from beaches all over the world. Using Google Maps and Slimbox, Sandrific.com has created an attractive interface to present geo-tagged photographs of her large sand collection. Britglyph is a nominee in the Net Art category of the Webby's. I had the pleasure of meeting Alfie Dennen, one of the brains behind Britglyph, earlier this year. To my eternal shame I have told Alfie at least twice of my eagerness to review Britglyph on Google Maps Mania, and both times I have promptly forgotten to actually do so. Britglyph is an amazing collaborative art work in which 61 people carried a rock to 61 locations in the UK, they then took a photograph of themselves with their rock and then sent it in to the site with the GPS location of the photograph. The result is an incredible image of a timepiece drawn on top of a map. The finished art work is a symbolic representation of John Harrison's Marine Chronometer H5, the tool which effectively solved the Longitudinal problem. Birdpost is nominated in the Social Networking category. We first featured Birdpost on Google Maps Mania in October of last year. The site is designed to allow bird watchers to report bird sightings and find the bird sightings of other bird watchers. You can use Birdpost's Google Map to either report bird sightings or find out about bird sightings in a particular area. To add a bird sighting the user just double clicks on the map and completes a short form. To find sightings the user just types a location into a search box. The map then centres on that location and shows previous sightings with blue markers on the map and lists the birds in a side panel. VisitSweden is nominated for a Webby in the Tourism category. VisitSweden was first featured on Google Maps Mania back in 2007 and is Sweden's official website for tourism and travel information. VisitSweden has created Google Maps for each of Sweden's main regions. 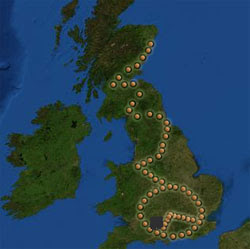 The maps each have a number of layers that can be selected to find interesting places to visit in the country. The layers include Culture, Family vacation, Nature experiences, Outdoor activities, Gastronomy, Coastline experiences, Wellness, Design and Airports.